Thank you for checking out our cabin as your home away from home on your vacation. I've recently completed building this dream home on the Sunshine Coast, I figured why not share the luxury with everyone else? The artist is reflected in this creation, moreover the overall aura and design is something that has been admired by past renters. Some say that it's like being in a luxury shanty hut in the forest, accompanied by the beautiful lamb bay. 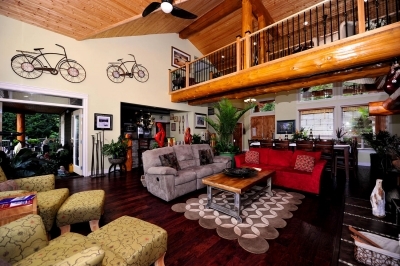 This beautiful west coast log home comes fully furnished with all amenities. With 6 bedrooms and 4 baths this home can accommodate large groups comfortably, moreover a large gourmet kitchen fully stocked with all your cooking needs. A dining table that sits 12 people and a office that comes with wireless complimentary internet. For the nights you feel like staying in, feel free to use the wood burning fireplace along with the theatre room located in the basement.With our new addition to our driveway there are plenty of parking spaces. This property is perfect for couples, families, or even large corporate groups. Their is something here for everyone weather you like to sit in front on the fire and roast marshmallows or sit on the beach and watch the wildlife do its thing. The waterfront view from this cabin is like no other, surrounded by nature its something that will not go unappreciated. We hope this vacation rental can accommodate your future visit to the sunshine coast. Entertaining was my main reason for creating this open living space. Food, wine and celebration are appreciated, surrounded by the warmth of our home. This is truly a special setting, especially when you are surrounded by the beautiful nature of Tuwanek. The home itself is very unique because of how it can blend in with its surroundings; yet at the same time still provide the cozy atmosphere of a classic cabin. One of the key features is the cedar log beams that have been exposed around the house. From the exterior, the west coast cedar logs decorate the front gables, along with 3 large pillars bringing out a very classy cabin look. Running through the interior of the house is two large parallel beams going through the middle of the family room and the dining room. These are one the few features of the home that makes it truly unique, which will make your stay that much more pleasant. Every season has something to offer here on the Sunshine Coast. If you are feeling active, there are endless outdoor activities such as, hiking, kayaking, mountain biking, scuba diving and MANY more. You can also just get cozy by the fire or read a book on the beach. The beach is definitely a special beach. Unlike many other popular beaches around the sunshine coast my beach is located only a few footsteps away from the cabin. The nice thing about this is that not only is it very private, but also very soothing and relaxing because of the inlet it has taken shape in. You won'' have to worry about random tourists walking around you, or boats racing disturbing the peaceful water. It'll be just you in your lonesome enjoying Tuwaneks natural beauty. When summer rolls around and the tide exposes the sand bar, I was blown away by the golden sand at low tide along with the crystal clear water. During the winter the tide is higher during the day, optimizing the west coast terrain. Something that you will also notice is the surplus of natural activity around the house. Take a look outside and you will notice a family of ducks swimming through the bay, or a couple herons hanging out on the beach, or even the great eagles that roam around the bay going from tree to tree. Moreover there have been numerous sightings of groups of dolphins making their way through the inlet at certain times of the years, something that not very many people get to see. Seeing all this natural activity will make you appreciate the beauty of the west coast, a coast line like no other in the world. My friends from the city are sometimes concerned about being isolated, but the quaint town of Sechelt is a 15 minute drive away. I know it's a drag to drive out that far but realistically you are coming this far to get away from all that. If you do have an urge to visit the town there's plenty of selection especially for a small town. For a coffee fix, Starbucks is just down the street, as is Straight Coffee, which sells organic fair trade coffee and delightful pastries and sandwiches. While you're at it, you can grab a gourmet pizza from Pepper Creek pizza, one of my personal favorites. Sechelt also has two sushi restaurants, as well as Thai, Vietnamese and Indian cuisine. For evening entertainment there is the Oceanside Lighthouse Pub and a movie theatre. There is something for everyone here on the Sunshine Coast. I hope you enjoy your stay. Have a great stay and hope to see you in the near future. Telephone : all local calls and area code 604 call included . -Hidden Grove and Sechelt Heritage Forests in Sandy Hook. -Chapman Falls and the "magical" trail along Chapman Creek. -Kinnickinnick Park Trail by the Sechelt Golf and Country Club. -Seawall walks at both Davis Bay and Sechelt, which are wheelchair accessible and offer gorgeous sunsets. -There are also many hikes elsewhere on the Sunshine Coast that are bound to satisfy every level of hiking ability. -Easy forest walks at Smuggler's Cove in Halfmoon Bay (shown in photo), and Cliff Gilker Park in -Roberts Creek. -Steep hikes at Soames Hill in Gibsons, and Mt. Daniel in Pender Harbour reward the hiker with expansive views of the coastline. The famous Sechelt Rapids. The trail is up near Egmont, about an hour's drive north of Sechelt. The best viewing times depend on the tides. Check out our Skookumchuck Narrows page for more information. Established in June of 1986, the Pender Harbour Golf Club's 9-hole golf course was built with a unique combination of flat and hilly fairways. Water hazards are scattered throughout to add to the challenge of the game. The fairways are fairly tight, with elevated greens and tees that enable you to take in the beautiful views of the surrounding mountains. Several annual, amateur tournaments are held here. Sechelt Golf and Country Club is an 18 hole, par 72 links style course, designed and built by Olson, Beatty and Hnatiuk (1990-1992). The course itself features generous fairways and large gently sloping greens, and there are just enough hazards to make the course challenging, while the multiple tee system allows players to golf at their own level. It can be best described as a beautiful golf course where wildlife abounds and there are veiws of the snow capped coastal range and Porpoise Bay. Up and down the Coast, you'll find countless beaches where you can indulge in a saltwater swim, with several beaches in and near Sechelt. These include Trail Bay and Davis Bay on the Georgia Straight, and Porpoise Bay in sheltered Sechelt Inlet. There is also fresh-water swimming in Trout Lake, just north of Sechelt, and indoor swimming at our wonderful new recreation centre, in the heart of Sechelt, just steps from the Visitor Centre. Many of our beaches are pebble beaches. If sand is important to you, try the South end of Davis Bay Beach, or Porpoise Bay Provincial Park. Or visit the stunning beaches of Thormanby Island (pictured below). The only overnight accommodation available on Thormanby is beachfront camping, but Thormanby can be reached by water taxi from Secret Cove and makes a great day trip from Sechelt. For information on even more attractions the Sunshine Coast has to offer, from Langdale to Egmont, call, email or visit us at the Sechelt Visitor Centre. Coast Salish Totem Poles are located in Sechelt and can be seen in front of Starbucks on Highway 101, across the street at the Sechelt Nation Government offices, and on the Sechelt Nation Band lands along the waterfront. The Rapids --- On a three-metre tide change, 200 billion gallons of water flow through the Skookumchuck, which connects Sechelt Inlet to Jervis Inlet. To view the most spectacular rapids, you want to time your hike so you arrive at the viewpoint when the tidal surge is at its strongest. The hike in takes about an hour from the parking lot. The Sechelt Indian Band opened a traditional First Nations Long House in 1996. Contact the Sechelt Indian Band for more information on tours and public events. The Sechelt Duck Marsh is home to many species of birds and offers a pleasant place to relax and catch your breath if you've had a busy day of activity. It's a great outing to make with your kids! Visit the Chapman Creek Fish Hatchery where you can view salmon in large pools at various stages of their development, before being released into the wild into Chapman Creek. In the fall, the salmon can be seen making their trip back up the creek to spawn. Enjoy a stroll along the Sechelt Pier where you can sit down and take in the view. Have a snack at Spirit Square in front of our Visitor Centre and enjoy the colourful gardens. In addition to being the home of the Sunshine Coast Festival of the Written Arts, Rockwood Lodge, located in the heart of the the town of Sechelt, is one of Sechelt's premier heritage sites and well-worth a visit to see its beautiful gardens. The Sechelt Night Market is a summer event happening every Thursday where one can enjoy local entertainment and an array of goods, from fresh produce to crafts of all kinds, sold by local vendors. Sechelt Farmers and Artisans Market is a feast for the eyes! It runs from April through September, rain or shine, featuring home grown produce, baked goods, crafts, and musical entertainment. Their motto is "We Make It, Bake It and Grow It!" The Labyrinth at St. Hilda's Anglican Church is a favourite spot for locals and tourists. Anyone from any tradition can walk the labyrinth. The Labyrinth is available to all 7 days a week. The Himalayan Blue Poppy Garden, located at the bottom of Shorncliffe Road on the path to Snickett Park, boasts a spectacular display of the exotic blue poppy. The "show" begins in mid- April but the poppies can be seen in their full glory in mid-May. The Sunshine Coast Botanical Gardens is an exciting new development here in Sechelt. Our trip was in early March just before spring official was upon us and it was a special family occasion for us 3 adult children, with our parents, and one baby. From the photos, the house looked like it would meet all our needs and more! Booking the property was extremely easy as the owner was immediately in contact with me and was very responsive to phone calls, emails and text messages! From the moment we stepped into the house, we were blown away by how warm it was - both literally and figuratively - because the fireplace was already going and it was well decorated in the most inviting way just as it showed in the photos. Basically each room was almost like walking into those show homes where you would be perfectly happy to move into without doing anything to it. In addition the kitchen was well stocked with plenty of appliances and cooking utensils. After having spent the weekend there, we realized how excellent the location is as it provides not only the secluded waterfront location with an amazing view from any room in the house, but also we were relatively close to the places we wanted to check out on the Sunshine Coast such as Gibsons (25 minutes), Roberts Creek (15 minutes) and Sechelt (10 minutes). I definitely received a pat on the back from each family member for finding this property for our little getaway. Everyone had their own beautiful space in the home, and yet our family still were very cozy when hanging out in open concept kitchen/living room/dining room with a fireplace by the windows looking out to the water. It definitely exceeded our expectations in terms of how both beautifully modern and rustic the property and how it made our trip that much more special! We can only imagine what it would be like in the spring/summertime!